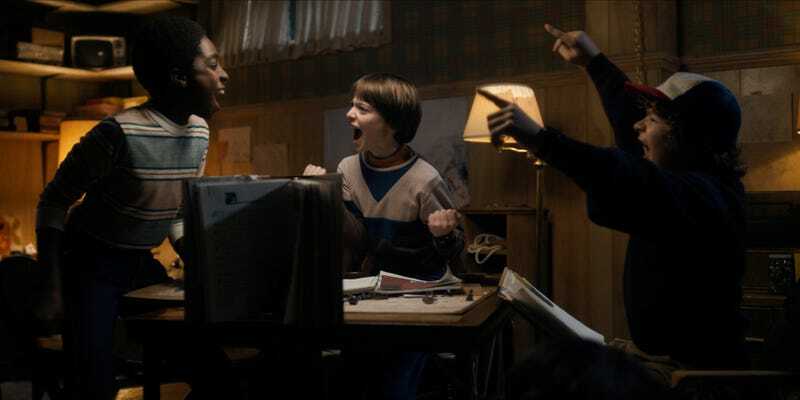 The Stranger Things kids are confirmed RPG addicts. Creating a character for a role-playing game is an intense experience. It’s thrilling and intimidating—often at the same time—to invent a fictional version of yourself and send them out on adventures. It’s another thing entirely when the character you’re making is based on the person in front of you. Developer Liam Ginty has released Mirror, a single-page tabletop RPG where players create characters based on their friends or loved ones. Players write down a series of four strengths and two weaknesses about the person they’re sitting across from, which are then used as skills and obstacles to overcome. You and your counterpart (along with a GM) then embark on a quest, which can be any RPG campaign in which the game mechanics fit. It lets players see how well their friends and partners know them—something he was personally curious about. Ginty said he first got the idea while developing an RPG where people play as themselves, figuring it would be easier (and perhaps more interesting) to play as someone else they know. Turns out, that actually might be more of a challenge. Since we often create avatars that are slightly cooler versions of ourselves, making a character based on a friend or partner puts players more outside of their comfort zone. I tested this out with my husband, playing a short campaign. He took on the role of Beth the Bard, and I was Tim the Tool Man Tailor (he’s really good at repairing stuff around the house, as well as fixing doublet buttons). At first, I’ll admit it was a bit uncomfortable: We’ve played RPGs together but never as each other. There was a fear that the weaknesses I wrote down would hurt his feelings, or that I would do something in the game that would make him feel bad about himself. I mean, he’s a secure dude, but hearing your spouse list off the things they think aren’t great about you is an easy way to put you on the short track to to couples’ therapy. According to Ginty, this has been a common fear among play-testers, including himself. As the game went on and we got into it, things got really exciting. I loved trying to figure out how Tim the Tool Man Tailor would respond to situations, and how our characters could best work together. TtTMT was best when needing to make deals with strangers—which made sense, given my husband’s great humor and how he’s never afraid to stop and ask for directions. Beth the Bard, on the other hand, preferred action—specifically, her music and “sweet dance moves” (his words, not mine). At one point, my husband chose to sing a lullaby to prevent a dragon egg from hatching... using one of the songs from my old band, Third Eclipse, which was on his iPhone. I’ll admit my form of early-’oos pop punk probably wasn’t designed to soothe the savage mythical beast, but our GM accepted it and it made me smile. I left the game feeling a new and unique connection to my spouse. It almost felt like therapy, stepping into my partner’s shoes and experiencing an adventure through his eyes... while he was doing the same through mine. Ginty said his game isn’t designed to serve as therapy (since he’s not a licensed therapist or anything), but he does see it as a useful tool for those looking to strengthen their bond, empathize, or gain new perspective on the people they care about. That said, he did mention how it’s important to make sure you really know the people you’re playing with, and that they’re comfortable having their identities explored like that. Mirror is currently available on Ginty’s itch.io page, as well as Drive Thru RPG, as a “pay what you want” model. Ginty said his next move is to possibly incorporate Mirror’s dice mechanics into a new fantasy murder mystery RPG he’s been working on, which he called “Grease meets Twin Peaks.” It wouldn’t include Mirror’s other attribute, meaning the character creation. But I’m sure Tim the Tool Main Tailor would totally fit in with the Pink Ladies, and Beth the Bard’s sweet dance moves work anywhere. Clarification: Earlier version said “Greece meets Twin Peaks,” not “Grease meets Twin Peaks.” This has been corrected.